The former Warren Brook Bridge was a simple span, built-up steel plate girder bridge with a reinforced concrete deck, reinforced concrete abutments and reinforced concrete retaining walls supporting the roadway subgrade on each approach. The structure spanned over the Warren Brook along the Cabot Trail near Ingonish Beach, Nova Scotia. Repairs had been completed on the structure over its lifetime; however, a call for proposals was issued in 2015 for the design of a replacement structure for the Warren Brook Bridge. 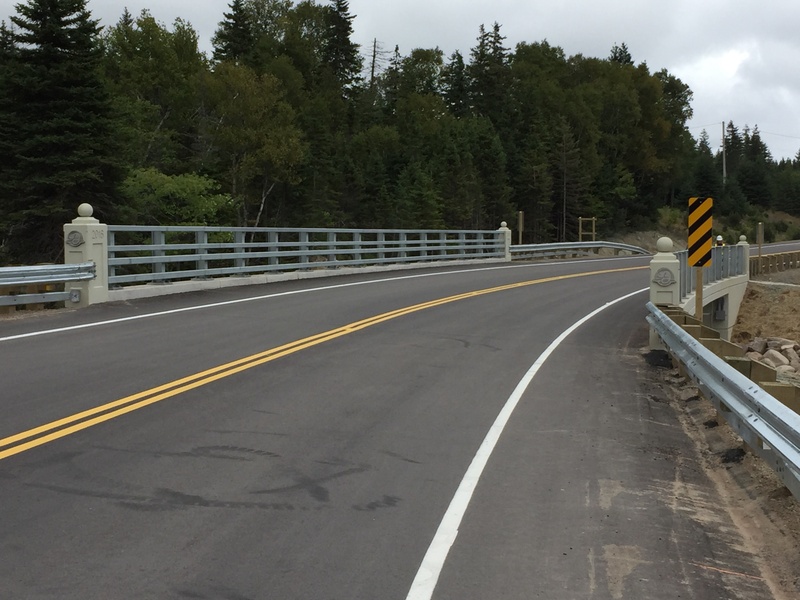 The project objective was to remove and replace the existing bridge in an efficient, cost-effective and environmentally friendly manner, and to realign the approaches on each side of the bridge to meet current standards. After a preliminary design stage that evaluated several structure type and highway alignment options, it was determined that a simple span, precast concrete girder bridge, with integral abutments supported by end bearing H-piles driven to refusal in bedrock best satisfied the project objectives. The replacement bridge superstructure consists of four (4), tangential 1200mm deep New England Bulb Tee (NEBT) precast concrete girders supporting a horizontally curved (radius = 190 metres), super-elevated, reinforced concrete deck. The superstructure is supported on fully integral, reinforced concrete abutments, positioned such that there is no requirement for temporary water control measures or in-water work during construction. The design for the new structure also incorporates decorative end pilasters and an open steel barrier rail to add to the aesthetics of the bridge.